I like both the black iPad Mini and the 2001 Space Odyssey prop white model. But the more I look at the color ones, like the neat red one above, the more I think they make sense. And the more I want them. 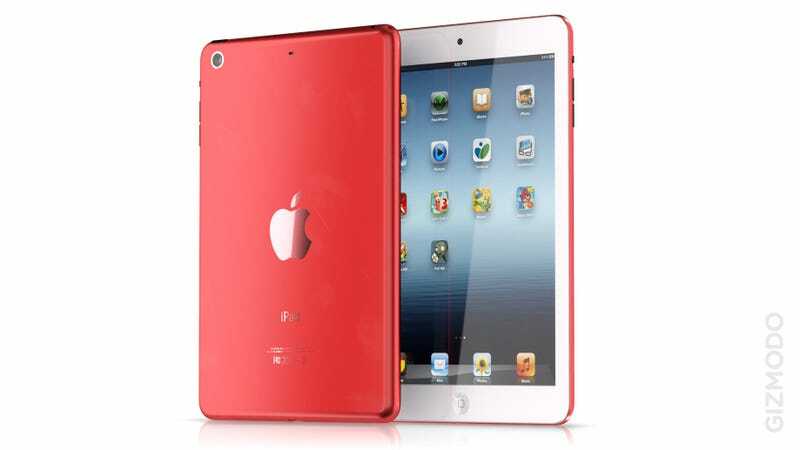 It's purely speculative at this point, but there are several reasons why color iPad Minis could be a reality. (Brightly) colored hardware has been an Apple feature since the time of the egg-shaped iMac. After the bondi blue original, Apple released multicolored iMacs in a move that stunned the all-beige industry at the time. It may sound stupid now, but this was a major manufacturing challenge—in terms of materials engineering, planning and stocking. People were going to like some colors more than others, which introduced a variable that nobody had ever tackled in the computer industry. Following an introductory ad that used the Rolling Stones's Like a Rainbow, the colored iMacs became a complete success. Apple kept iterating them until the all-white sunflower iMac—with its LCD screen—was released. After the iMac success, the color trickled down to other Apple products. The iPod minis and nanos came in colors too, and that's the point in which gadgets start becoming fashion accessories. People loved them, and Apple sold a billion tons of them through the years. But the more expensive hard-drive iPod models kept being white, with the exception of the black and red U2 iPod. It felt as if Apple was trying to differentiate the more expensive models from the cheaper "fun" ones. Or perhaps it was just a way to simplify things in the products that cost the most to produce. The iPad Mini may be another case for product differentiation. Since it's going to be significantly cheaper, Apple may want to draw a line between the black or white large iPads and the Minis. And, on top of that, color would also make the iPad mini completely different from the Android 7-inch tablets from the start. It may sound frivolous, but when the holiday shopping season comes, color could be a definitive winning factor. It has worked beautifully for them in the past. But then again, perhaps it may not happen in the first generation of the iPad Mini. Maybe Apple's saving it for the second version. After all, color only came to the iPod touch in this generation, not the first one. And we haven't seen any leaked color components, only black and white, so it's most probably not going to happen. Still, it kind of makes sense. iPhone and 10-inch iPad could be the serious, more expensive products, while the iPod touch and iPad mini become the fun, cheaper ones, all in color. That would be really nice.